Are you guilty of skipping one of the biggest titles of last year? Well don't fret friends, because Fallout: New Vegas' Ultimate Edition is now available on retail shelves everywhere. For holdouts that didn't pick up the game when it was released (and anyone who hasn't been keeping up with the dlc) the UE has a load of new content. All of the downloadable mission packs are included in the box as well as a new level cap of 50. There's also a bunch of new weapons, ammunition types and recipes for cooking up your own stuff. I'll also go ahead and assume (at the great risk that that implies) that the majority of the bugs that were present when the open world action/adventure title first released are dead and gone at this point. So, lots of extra's and a more stable experience. What's not to like? With the release of the Ultimate Edition Bethesda Softworks presents the definitive edition of Fallout: New Vegas®. 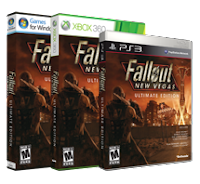 This complete package, which includes the full version of Fallout: New Vegas as well as the Dead Money, Honest Hearts, Old World Blues and Lonesome Road add-on packs, allows you to experience everything that New Vegas has to offer. Each of these four main add-on packs combined ultimately raise the level cap to 50. To sweeten the pot, you’ll be armed with the latest cache of unique weapons, ammo types and recipes from the most recent add-on packs Courier’s Stash and Gun Runners Arsenal.